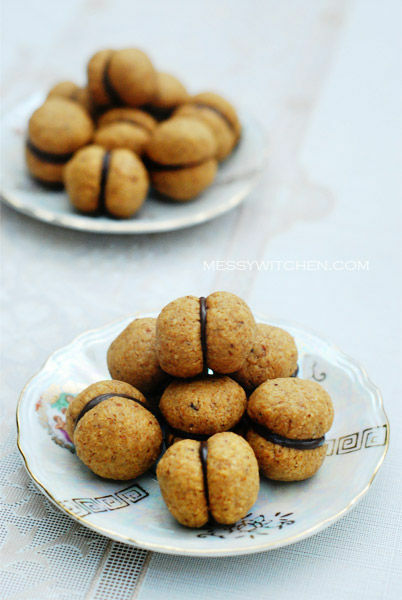 Baci di Dama is Italian for lady’s kisses which is what this cookie is all about and originated from. Yes the cookie resemble a pouty looking lips and also they sandwiched together like kissing! Best thing about this cookie? 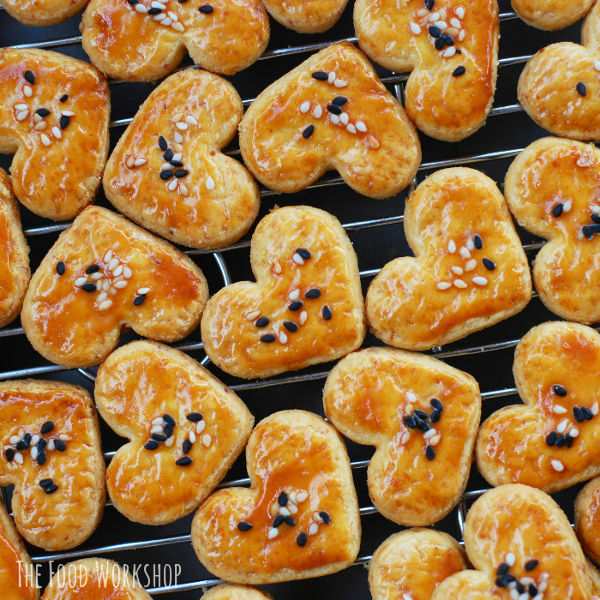 Super easy to make, delicious and are wonderful gift for your loved ones. Oh, it’s gluten free too. Care for some lady’s kisses? Me! ME! mE! First, toast hazelnuts in the oven. Once cool, remove the skin by hand. Then pulse the hazelnuts into a fine consistency. 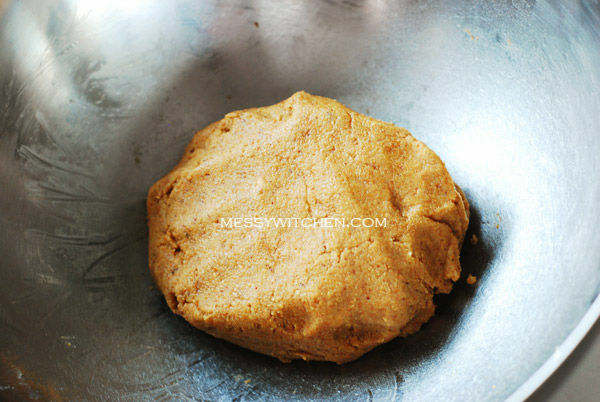 Mix butter, rice flour, vanilla sugar, ground hazelnuts and salt by hand until they are incorporated. Knead it a little to make sure the dough holds together. 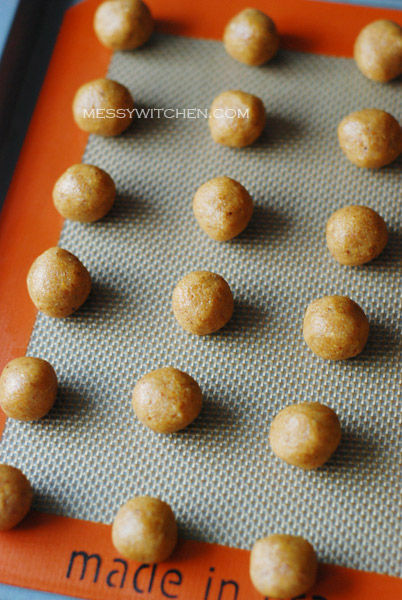 Make 5g balls and place on a baking tray or silicon mat. Bake for 10-14 minutes. Freshly baked from the oven. Let the cookies cool on wire rack. 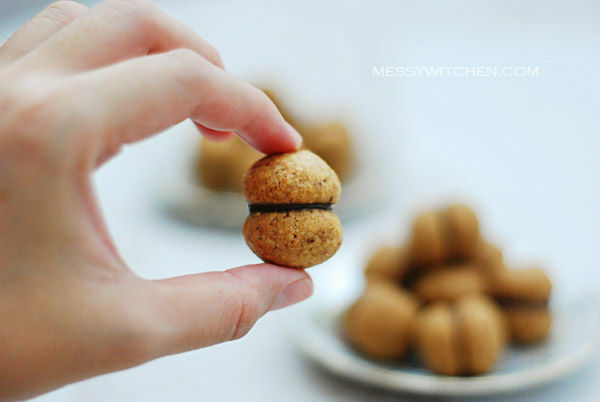 Spoon about 1/2 teaspoon or more of the chocolate on the bottom of one cookie and then sandwich it with another cookie. Place baci di dama on a wire rack until the chocolate is firm. Store the cookies in an airtight container. I’ve yet to experiment its longest storing period because I (we) ate all within 3 days! 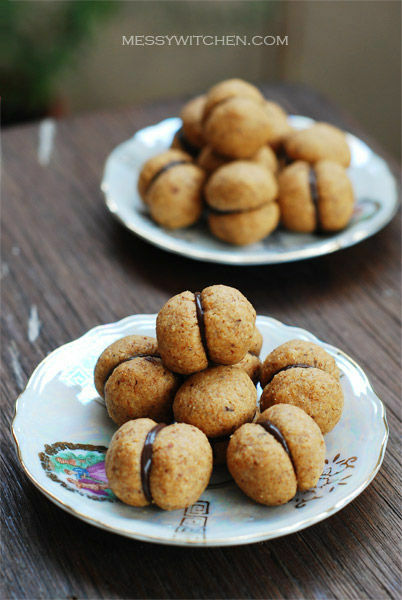 Like the tahini almond cookies I made the other day, this one is highly addictive too. 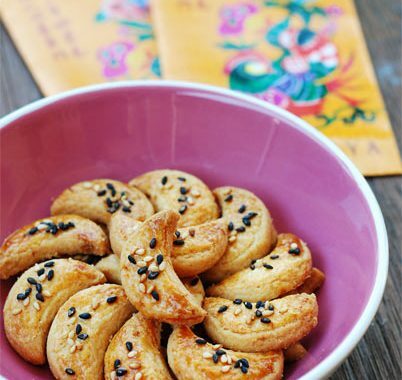 I’m planning to make these for Chinese New Year. To tell you how famous this cookie is with my household, even my dog is requesting for one every time I open the cookie jar but too bad he can’t eat it because there’s chocolate in it. Note: If using all-purpose flour, do sift it. 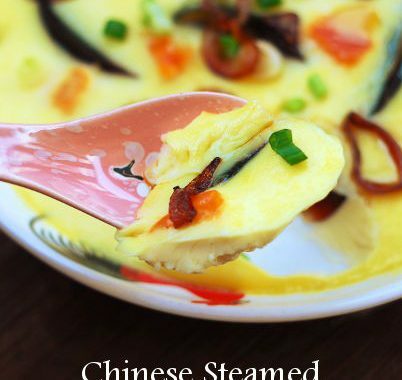 Rice flour is highly recommended because it will yield a crispy texture. 1. 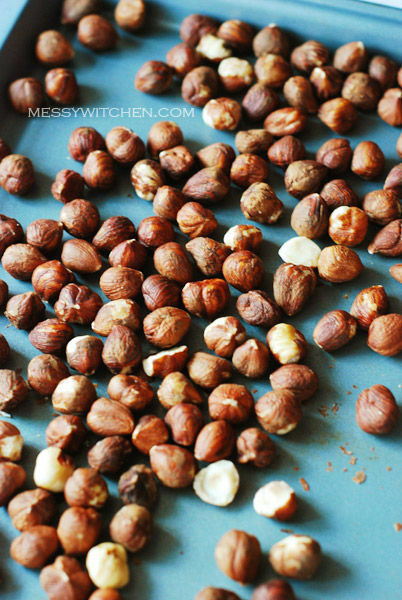 Place toasted hazelnuts in the food processor and pulse until fine. 2. Put ground hazelnuts, rice flour, cubed butter, sugar and salt in a bowl. Mix the ingredients together by hand until completely incorporated. You should get a smooth dough that holds together. If not, give it a few kneads. 3. 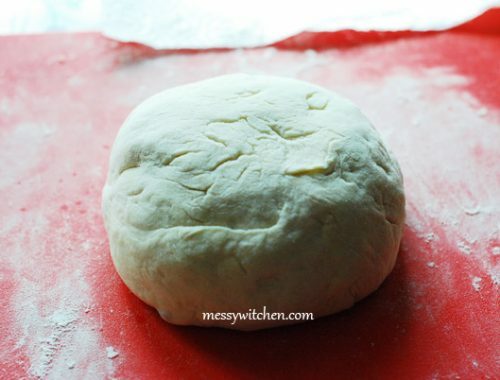 Chill dough in the fridge until firm. Shortcut: I placed ’em in the freezer for 10 mins. 4. Preheat oven to 160oC and line baking tray with baking paper. 5. 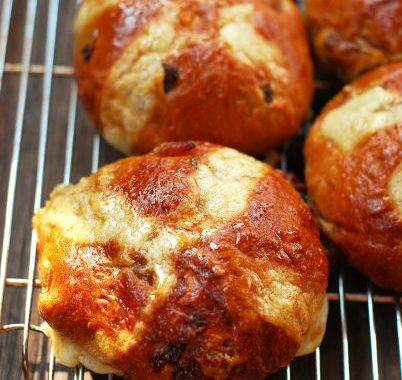 Remove dough from fridge and roll into balls about 5g each. 6. 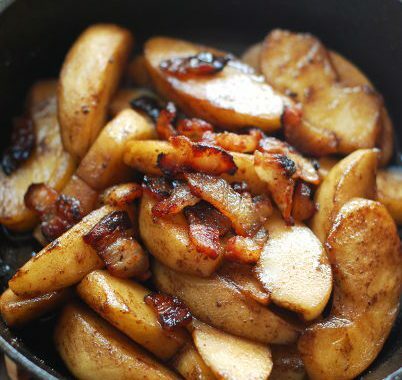 Bake for around 10 to 14 minutes, or until lightly golden brown. Transfer cookies to cooling rack. 7. Melt chocolate in bain marie. Put about 1/2 teaspoon or more chocolate on the bottom of cookie and sandwich with another cookie. 8. 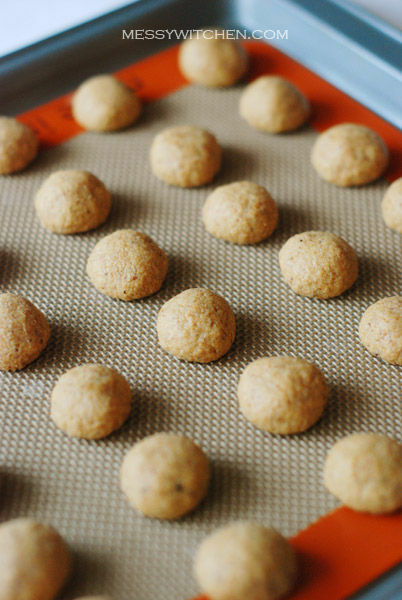 Place Baci di Dama on cooling rack until the chocolate is set. Keep in an air-tight container. 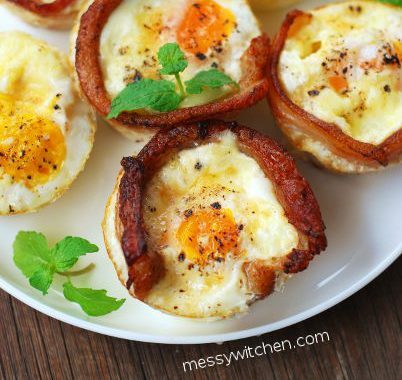 Going to make them now!! Will share the result soon and thanks for the recipe! It’s actually hazelnut, not walnut. The recipe actually ask for castor sugar. I use vanilla sugar because I wanted to incorporate the perfumey vanilla flavour into my cookie. Ya vanilla sugar is not something you can get easily in Asian countries. But no fear. 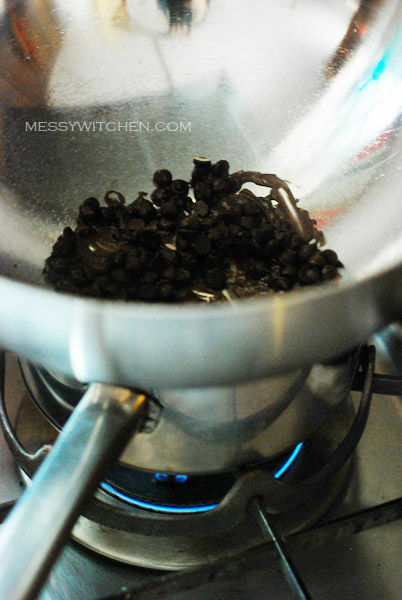 You can make vanilla sugar yourself by mixing scraped seed of one vanilla pod with sugar. Very easy. che-cheh, hehehe ya i meant to say hazelnut. Ya the shop owner got puzzled for a few seconds then asked me whether am i referring to a local recipe. Ah so vanilla pod is the answer, will try again someday. 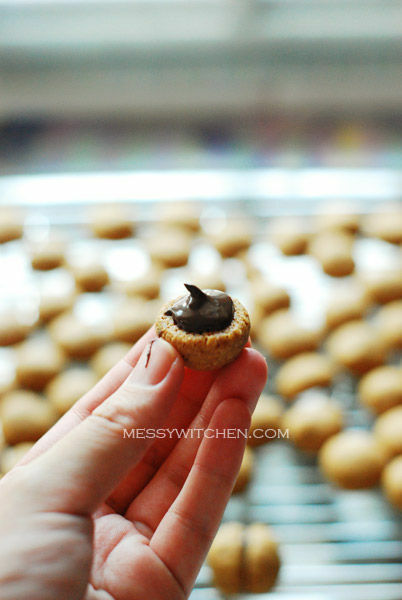 I made the cookies d, it’s on my blog, but it was a rough session i had… Sob…. Hope that you can spare me some tips into getting it right….. Long story…. Hugs….. I look forward to your next post! Gonna make your salted egg cookies also, my dad loves it! 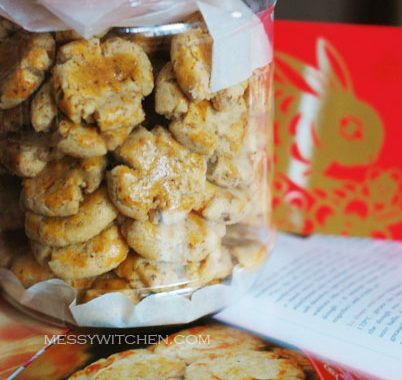 I will make Baci di Dama and salted egg cookies for CNY, will try out the rest of your cookie recipes when free. 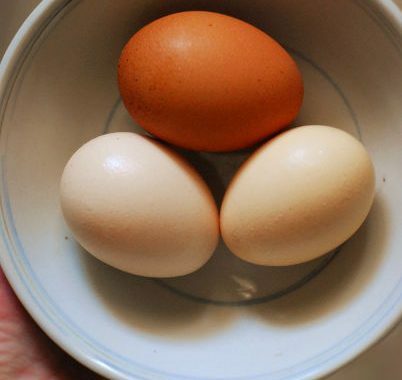 Whenever i go to SG, i do not have a kitchen, so i wont be cooking or baking as frequent… Sad isn’t it?? Glad your dad like the salted egg cookies. I’m not making them this year. 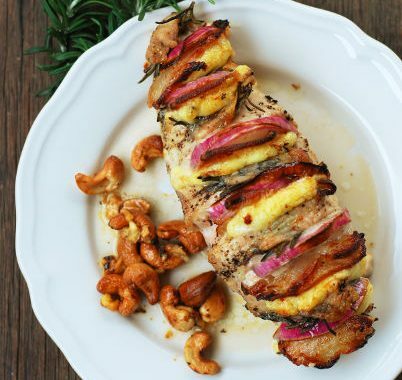 Wanna try new recipe. Okay hopping to your blog now. am Italian and I love Baci di Dama! You made them perfectly!